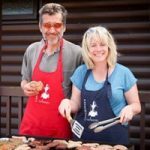 BBQ 2017 – The Chefs! We hold a number of events throughout the season for our members and their families and friends. Recently these have included our annual snow race, trips to the snowdome at Braehead, cheese and wine nights, gin tastings as well as our annual dry slope race and BBQ at the Pavillion on RM Condor.